"YOU DON'T NEED TO GO TO CHURCH TO BE A CHRISTIAN!" How many times have you heard someone make that statement? Perhaps you have said it yourself? TRUE, a Christian is one who has received the Lord Jesus Christ as his personal Saviour, realizing his sinful condition before a holy God (Rom. 3:23), and calling upon the Lord to save him (Rom. 10:9-13). Sadly many "so called" churches are filled with people who have never done this, and some who have trusted in Christ have never seen the need to be part of a local church. Neither CHURCH ATTENDANCE nor CHURCH MEMBERSHIP make one a Christian! It is difficult to be a sailor without a ship, a worker without a factory, or a student without a school. These are unnatural situations, and so is being a Christian without regular church attendance and membership in a local assembly of believers. While Paul writes to the Christians at Corinth about their part in a great spiritual "body" of all born-again believers formed by baptism (immersion) in the sphere of the Holy Spirit (I Cor. 12:12,13), he addresses them as an organized local assembly (I Cor. 1:2), giving them instruction , on who and who not should be part of their membership (I Cor. 5:1-13), how the pastor should be supported (I Cor. 9:7-14), how the Lord's Supper should be observed (I Cor. 11:17-31), and how services should be conducted (I Cor. 14:23-40). Paul assumed that those who were part of the SPIRITUAL BODY OF CHRIST would be part of the VISIBLE LOCAL ASSEMBLY as well. This is the natural condition for a believer. It was God's plan for the Corinthians, and it's God's plan for YOU! As characteristic of the "last days", Paul said men would be "disobedient to parents" and "lovers of pleasures" among other things (II Tim. 3:2,4). A general. disregard for authority of any kind, and the quest for self-gratification are certainly characteristic of the age in which we are now living. Unfortunately, many Christians seem to be caught up in the "spirit of the age" rather than to be led by the "Spirit of the ages", the Holy Spirit of God. 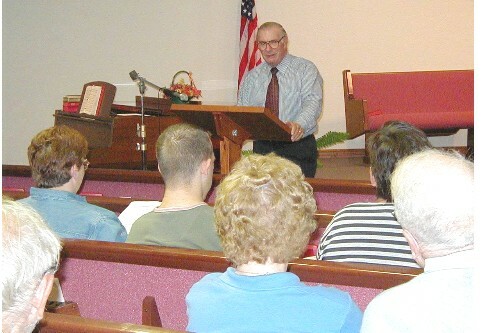 Many Christians do not want to submit themselves to the authority of a local assembly by becoming part of its membership, while others do not want to be "burdened" with regular attendance at any particular local assembly, so that they might be free to partake of special programs, wherever they are being offered. Perhaps their motto for Christian service is, "It is more blessed to receive!" This characteristic of many Christians today has led to a new phrase being added to the Christian's vocabulary . . . "the church tramp". May this never be said of you! CHURCH INVOLVES AN ORGANIZATION AND AN INVOLVEMENT. In Titus 1:5, the Apostle Paul reminds his "trouble-shooter" Titus that his mission on to "set in order the things that are wanting". Literally, this meant Titus was to "straighten out" or correct things that were wrong amongst the Christian assemblies on the island of Crete. These local bodies of believers had probably been begun by Jewish Christians who first heard the gospel in Jerusalem on the day of Pentecost (Acts 2:11), and carried it back with them to Crete. It is probable that these churches had been functioning for some time before the Apostle visited Crete after his first Roman imprisonment. Yet, it is quite clear from Paul's instructions to Titus, that these churches were imperfectly organized. While they may have had leadership of some sort, that leadership was not properly established or set up. Therefore, Paul directed Titus to "ordain elders in every city" (Titus 1:5). A true local New Testament church is an assembly of baptized believers, organized according to the principles set forth in the Book of Acts and the Epistles. While the Scriptures are clear on what an elder is, they do not teach any specific number of elders for a local assembly, nor that multiple elders are a necessity. By comparing Titus 1:5 with 1:7, Acts 20:17 with 20:28, and I Peter 5:1 with 5:2, it may be easily shown that an elder, a bishop, and a pastor (shepherd or flock feeder) are one and the same person. The phrase "in every city" (Titus 1:5) literally means "city by city", so that the elders (plural) that Titus was to establish, were not necessary multiple elders in any one assembly, but may just as accurately be considered as a collective grouping, one each being established "city by city". In fact, the significant change to the singular bishop (Titus 1:7) "for a bishop" may very well confirm the latter understanding. The word "ordain" (kathistemi) does not mean that Titus selected the "elders", but simply that he was to see that they were duly established in each city. The same Greek word is used in Acts 6:3 and translated "appoint". In the context there, it is clear that the seven "deacons" were to have been chosen by the congregation at Jerusalem. . . "Wherefore, brethren, look among you for seven men, . . . The congregation selected their own deacons and the apostles saw that they were properly placed in their offices as deacons. GOD LOOKS UPON THE LOCAL CHURCH AS AN ORGANIZATION. This may be seen from the emphasis Paul placed upon the proper organizing of the Cretan churches. It is also true that local assemblies may cease to be true churches, when they do not manifest a faith and order consistent with the Word of God. This was certainly true of the church at Ephesus, which was in danger of having its "lampstand" (AV "candlestick") removed by Christ (Rev. 2:5), the lampstand being symbolic of that assembly's recognition as a true church. Indeed a person may be a member of some local congregation of professing Christians, but not be a member of a true local church, the visible manifestation of the spiritual body of Christ in a given locale. Are you a member of God's organization, the local New Testament church? GOD LOOKS UPON THE LOCAL CHURCH AS AN INVOLVEMENT. As the church is the only institution established by the Lord Himself (Mt. 16:18), God expects every believer to have an INVOLVEMENT with a local New Testament church. A survey of the Word-of God will reveal that this involvement or commitment is in a least four areas. 1. INVOLVEMENT WITH MEMBERSHIP. It is interesting to note that the first body of Christians are recorded for us thusly; "the number of names together was about an hundred ' and twenty" (Acts 1:15). The Holy Spirit could just have easily recorded "persons" or "souls", etc. but the choice of the word "names" infers a roll or list of members. On the day of Pentecost, the three thousand were "added" (Acts 2:41), that is "added to the church" (Acts 2:47). As the sailor has his ship, and the student his school, God planned that each believer would be part of a local assembly of believers. Church membership is Scriptural. It is not optional. It is God's perfect will for every believer! 2. INVOLVEMENT WITH MEETINGS. The Jerusalem Christians continued steadfastly" (Acts 2:42). They were not "hit and miss" or one service a week Christians. You could count on them, even if there was something more interesting going on at some synagogue or the Roman forum in the city. Within the next twenty to thirty years the pattern was clearly established that Christians met together on the Lord's Day (Acts 20:7), the first day of the week, the day which commemorates the resurrection of Jesus Christ (Matthew 28:1). Indeed, God established the pattern of meeting together in the local church as the principle means by which Christians would encourage one another in their faith and daily walk with Christ (Hebrews 10:23-25). While we may not say that missing church is a sin, missing church will certainly lead to sin, if it becomes a regular habit. 3. INVOLVEMENT WITH MONEY. Paul clearly taught the Corinthian Christians that they had a responsibility to financially support those who were charged with the full-time ministry of the Word of God. He, said that they who preach the gospel should live of the gospel (I Cor. 9:7-9, 14). It is amazing how many Christians want to support "every good cause" to the neglect of the local church, yet wonder why the church is not doing more to reach the community for Christ, or why the church buildings are in such a state of repair. The giving of the Christians was to be channeled through the local assembly of which they were a part. 4. INVOLVEMENT WITH MINISTRY. The Lord gave "pastor-teachers" for the perfecting of the saints for the work of the ministry" (Eph. 4:11, 12). The permanent "gifts of the Holy Spirit" were given for ministry and edification in the local assembly (I Cor. 12:27-31). Therefore, Christians who are not members of a local New Testament church can not fully exercise their potential to be of service to the Lord. They have limited their own usefulness to Him by trying to circumvent the organization He has established to carry on the ministry of the Word and the evangelization of the lost. This INVOLVEMENT also meant taking part in the decision making process. This is possible because the Holy Spirit indwells each born again believer (I Cor. 6:19) and can lead them into a unity of action (Rom. 8:14). The word ordain used of the selection of the elders in Acts 14:23 is a different Greek word than in Titus 1:5. It is the word cheirotoneo, literally "a raising of the hands" and clearly shows that the assemblies elected their own pastors through the democratic process. It is also used in 2 Cor. 8:19 of the selection of a Christian brother to accompany the collection for the poor saints at Jerusalem.
. . . if you a born-again Christian and not a member of a local New Testament church. Search your heart and analyze the reasons why. Could it be you are caught up by the spirit of the age, or the spirit of disobedience, rather than being led by the Spirit of God?